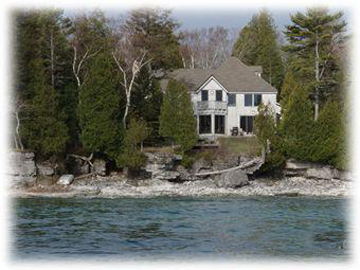 Our Jacksonport Door County home is a treasure. Situated on Lake Michigan and alongside a county park w limited visitors by design, beautiful nature and bike trails. 3BR, 3.5BA, sleeps 7, see site for photos/details. Master bath has a double shower & walkout outdoor shower. Details such as cherry wood and slate floors throughout 1st flr, Door County stone countertops/fireplace are examples of the designers attention to detail. Two outdoor patios, Tempur-Pedic king size bed make slumber a dream! 2019 Rates: $290-$325 daily OS; $1950-$2900 weekly.